Thanks to Amy and Jim for inspiring this week's column! Forty years after the World's Columbian Exposition of 1893, Chicago became the focus of the world again with the Century of Progress World�s Fair of 1933-34. 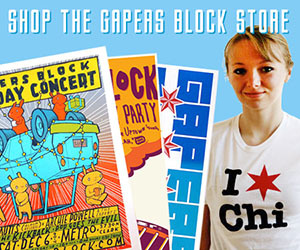 The Century of Progress celebrated the centennial anniversary of Chicago�s incorporation as a city in 1833 by promoting the scientific and technological achievements of the past 100 years. The fair opened on May 27, 1933, and the grounds of the fair spread from 12th Street (Roosevelt Road) to 38th Street along the lakefront. [See a complete map of the fair at the Chicago History Society website. http://www.chicagohs.org/history/century/map.html] On October 31, 1934, the fair closed for the last time, but over the course of the two seasons during which it was open, the Century of Progress attracted nearly 49 million visitors. One of the highlights of the fair occurred when Italian aviator Italo Balbo led a squadron of 24 Savoia-Marchetti SM.55X flying boats in a historic transatlantic flight from Rome to Chicago, landing on Lake Michigan near the fairgrounds. Italo Balbo was born in 1896. He served as an officer during World War I and, after the war, joined the Italian Fascist movement, quickly rising to a leadership position. In 1922, Balbo was one of the quadrumvirate instrumental in bringing Benito Mussolini to power. Mussolini first appointed Balbo as minister of the air force, the Regia Aeronautica, in 1926 despite the fact that Balbo had no previous flying experience. He learned quickly, however, and the flight from Italy to the Century of Progress fair was one of the crowning achievements of his career. Balbo and the squadron of sea-planes left Italy on June 30, 1933 and arrived in Chicago on July 15 after making several short stops in Canada and elsewhere along the way. Balbo even agreed to carry airmail on the flight, and letters carried on the trip still survive to this day. 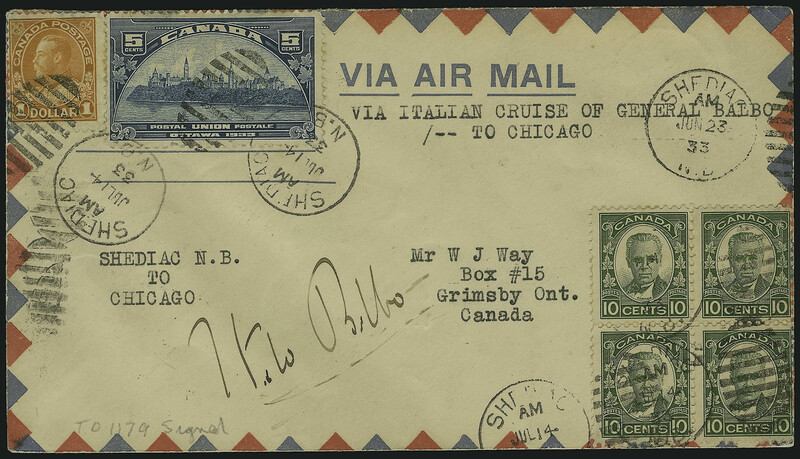 This airmail envelope, currently up for auction, was autographed by Balbo and includes a commemorative note reading, "Via Italian cruise of General Balbo � to Chicago." In honor of his journey to the Century of Progress, Chicago renamed 7th Street Balbo Drive. However, the street name is not the only lingering reminder of Balbo's visit. In an additional gesture of generosity, Mussolini plundered a Roman column, dating from the second century A.D., from a portico near the Porta Marina of Ostica Antica, the ancient port city of Rome. The column was shipped to Chicago and erected in front of the Italian pavilion of the Century of Progress fair in 1934, after Balbo�s flight. Today the Balbo Monument, as it is known, is one of, perhaps even the only structure remaining from the Century of Progress. It can be found in lonely isolation in Burnham Park, near the lakefront bike trail just east of Soldier Field. The 2,000 year-old column from Ostica Antica stands on a travertine marble base with a fading inscription in both Italian and English that reads, "This column, twenty centuries old, was erected on the beach of Ostia, the port of Imperial Rome, to watch over the fortunes and victories of the Roman triremes. Fascist Italy, with the sponsorship of Benito Mussolini, presents to Chicago a symbol and memorial in honor of the Atlantic Squadron led by Balbo, which with Roman daring, flew across the ocean in the 11th year of the Fascist era." Mussolini appointed Balbo as the governor-general of Libya shortly after Balbo's triumphant return to Italy from his Chicago flight. He served as Libya's governor-general until 1940 when, returning from a patrol, his plane was shot down by friendly-fire near Tobruk, Libya after Balbo supposedly failed to give the correct recognition signal for his plane. He was 44 years old. Chicago Historical Society. History Files: Century of Progress. Includes a brief history of the fair plus photographs, images of artifacts, and a bibliography for more information. Ostia: Harbour City of Ancient Rome. This website includes everything you could possibly want to know about this ancient city. Includes history, information about excavations, photos, articles, bibliographies and more. Be sure to visit the page dedicated to Balbo's Monument which includes a photo of its unveiling at the Century of Progress. University of Wisconsin-Madison. Memorial Library. Department of Special Collections. Italian Life under Fascism: Selections from the Fry Collection. This online exhibit provides a fascinating insight into Fascist Italy through books, magazines and other printed material published during the era of the Fascist regime. "The tropical rain fell in drenching sheets, hammering the corrugated roof of the clinic building, roaring down the metal gutters, splashing on the ground in a torrent. Roberta Carter sighed and stared out the window. From the clinic, she could hardly see the beach or the ocean beyond, cloaked in low fog. This wasn't what she had expected when she had come to the fishing village of Bahia Anasco, on the west coast of Costa Rica, to spend two months as a visiting physician. Bobbie Carter had expected sun and relaxation, after two grueling years of residency at Michael Reese in Chicago. "She had been in Bahia Anasco now for three weeks. And it had rained every day." Michael Crichton was born in Chicago, IL on October 23, 1942 (but raised in Rosyln, New York). In addition to being a hugely successful author, writer and filmmaker, Crichton also has a medical degree from Harvard Medical School. He has also won numerous awards in his role as creator and co-producer of the long-running television series ER, which itself was based on Chicago's Cook County Hospital. Visit the official site of Michael Crichton for more information. Have a topic you would like to see in "Ask the Librarian?" 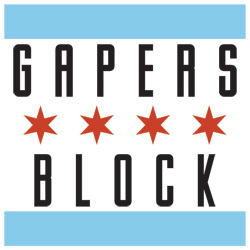 Send your suggestions to librarian@gapersblock and it may be featured in a future column. A street named for a flyin' fascist! Wow, that's fascinating and disturbing.